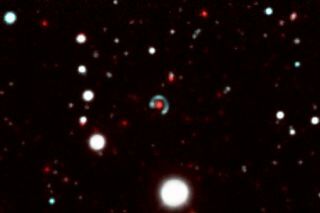 The recently discovered "Canarias Einstein ring" formed when a source galaxy's light (bluish ring) bent around a foreground galaxy (red dot) because of the foreground galaxy's gravity. The one galaxy is almost immediately in front of the other from Earth's perspective, but they are actually separated by 4 billion light-years. An early galaxy — 10 billion light-years away — has been transformed into an almost perfect circle, thanks to the twisting and bending of light by gravity. Albert Einstein theorized that the fabric of space-time was not rigid, but flexible, like the surface of a trampoline. A massive object, in this case a foreground galaxy, can bend space the way a bowling ball bends the fabric of the trampoline. That bend causes any light from background objects to curve around the foreground object instead of traveling in a straight line — and if the two objects are perfectly lined up, the background galaxy will appear as a circle surrounding the foreground, or lens, galaxy, in what scientists call an "Einstein ring." While hundreds of gravitational lenses are currently known, less than a dozen of them are full or partial Einstein rings — making the latest discovery a rare celestial occurrence. The Einstein ring's discovery was made by happenstance when Margherita Bettinelli, a Ph.D. student at the Instituto de Astrofísica de Canarias (IAC) and the University of La Laguna, in the Canary Islands, was working on her thesis. She was analyzing the collection of stars within the Sculptor dwarf galaxy — a puny galaxy located a mere 290,000 light-years away — when the Einstein ring caught her eye. Bettinelli and her colleagues performed follow-up observations of the ring with the Gran Telescopio Canarias, a 10.4-meter telescope on Spain's Canary Islands. Their new images show that the Einstein Ring, now known as the "Canarias Einstein Ring," is one of the most symmetrical rings yet, meaning that the source galaxy and the lens galaxy are almost perfectly aligned. They're separated by a mere 0.2 arcseconds — a distance 150 times smaller than the apparent size of the full moon. Although their apparent distance in the sky may be small, their physical distance is vast. The two arephysically separated by 4 billion light-years. "Studying these phenomena gives us especially relevant information about the composition of the source [background] galaxy, and also about the structure of the gravitational field and of the dark matter in the lens [foreground] galaxy," Antonio Aparicio, an IAC astrophysicist and co-author on the new work, said in a statement.